Human rights groups are alarmed by the administration’s proposal to dramatically expand family detention for undocumented women and children. Human rights groups are alarmed that the administration is nevertheless planning to double the number of people in family detention. The controversial practice of locking up women and their children, many of whom are awaiting asylum hearings, had been all but abandoned before this year. Calls for closing the two other centers opened this summer in Texas and New Mexico have intensified in recent weeks due to reports of “deplorable” conditions. “The Obama administration is playing with the lives of these women and children in order to earn political points. What it comes down to is the administration being tough on immigration,” said Silky Shah of the Detention Watch Network. Shah’s organization joined more than 160 civil and immigrant rights, faith-based, and criminal justice organizations signing a letter to the Obama administration on Thursday criticizing the proposed Dilley facility and calling for the closure of the other family detention centers. Another cause for concern is the company that the government chose to operate the new detention center, Corrections Corporation of America. CCA got its start in Texas three decades ago when it scored a contract for a federal immigration detention center in Houston. It’s now the largest private prison operator in the country. CCA has been sued a number of times for negligence, abuse and other mistreatment. The company is currently under investigation for allegations of fraud and corruption at the Idaho Correction Center. CCA has profited handsomely from the criminalization of noncitizens, but its record on immigration detention is particularly poor. The government stopped holding families at a CCA-run detention center in Taylor, Texas, in 2009 after the company was sued for mistreating women and children, some of whom reported that they were forced to wear prison uniforms. 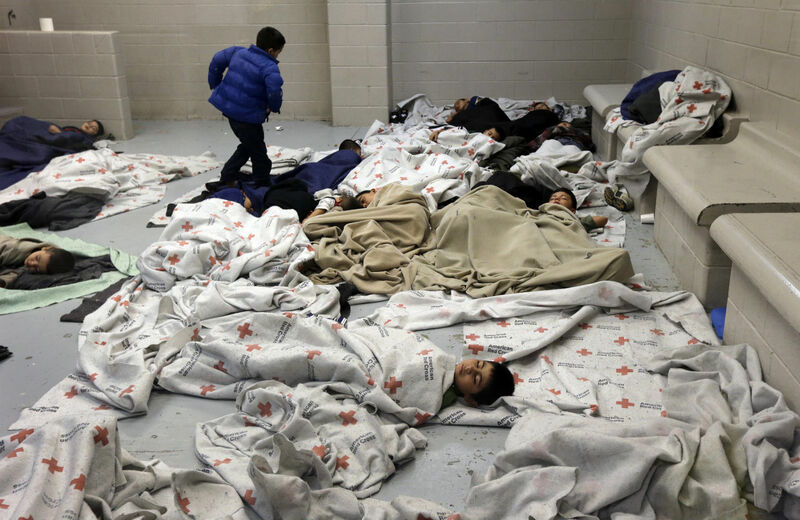 In 2011, the American Civil Liberties Union released records of 185 allegations of sexual abuse at CCA detention centers over four years; fifty-six of the reports came from facilities in Texas. Even before the government’s contract with CCA for the Dilley center was announced last Tuesday there were questions about the deal. According to a Texas nonprofit, the Immigration and Customs Enforcement Agency did not take public bids before it signed up CCA. That the government and the company are tight is not particularly surprising, as CCA has vastly outspent other private prison companies on lobbying. CCA was profiting from the refugee crisis at the border before the Dilley deal, too. Investors anticipated that the surge in migrants would necessitate new detention services; CCA’s stocks went up by 8.5 percent in August, compared to a 1.5 percent rise in the S&P. “Investors see this as an opportunity. This is a potentially untapped market that will have very strong demand,” Alex Friedmann, an activist investor who holds CCA stocks, told CNN Money. Concern about the role of prison corporations like CCA and the GEO Group, the company that operates a family center in Karnes, Texas, (and has its own dubious record of abuse), is only a small part of the backlash to the expansion of family detention, however. Many of the women and children are pursuing asylum, and advocates contend that mass detention—no matter who’s running the facility—is inconsistent with international guidelines for the treatment of refugees, as well as physically and psychologically harmful to children. Lawyers report that instead of evaluating on a case-by-case basis and releasing those whose fear of return is credible until their court date, officials are effectively denying bond en masse by setting it nearly six times higher than the national norm. “Many of these women and children have claims to protection and asylum here in the United State. To respond by locking them up in centers that are remote, far away from legal services…. It just doesn’t make any sense,” said Katharina Obser of the Women’s Refugee Commission. Detaining families is significantly more expensive than alternatives like releasing people with monitoring bracelets. So why is the government intent on expanding the practice? Government attorneys have argued against releasing noncitizen mothers and children under bond on the basis that they present a “national security threat.” The agency claims that detention will discourage other migrants from crossing the border. But there’s very little evidence to support that claim. In order to back up its argument, the Department of Homeland Security has cited a study from Vanderbilt University—a study that actually indicates the opposite, one of its principal authors says. Obser said that the government’s detention-as-deterrence policy has the perverse effect of keeping individuals who have real claims to protection from making them. Lack of access to legal services has been a common complaint in the family centers. Rosché is concerned that other women may be choosing voluntary deportation instead of fighting for asylum in the courts because conditions in detention are so bad. It’s not that none of their claims are valid. Only three asylum cases from women held at Artesia have gotten a final verdict from a judge, but in all of the cases the women’s claims were upheld. Even if detention were effective as deterrence it would be inconsistent with guidelines laid out by the United Nations high commissioner for refugees. “Detention policies aimed at deterrence are generally unlawful under international human rights law as they are not based on an individual assessment as to the necessity to detain,” they read. It’s not clear whether the government plans to expand family detention centers beyond Dilley. Certainly, there will be encouragement from the private prison lobby to do so. Locking up more women and children might line CCA’s pockets, but it doesn’t actually serve the government’s goal of returning people who do not have legitimate claims to asylum to their home countries more quickly. As Rosché pointed out, the backlog in the immigration courts is a bigger hurdle. “Why don’t we spend that $200 a day to hire more judges?” she asked. Read More: Betrayed by Obama, Latino activists debate boycotting the 2014 midterms.